The ecosystem concept is especially interesting to understand the workings of nature and many environmental issues that exist today. Nature is whole essence of our planet. It must be stressed that human life is developed in close relationship with nature and its operation affects us completely. It is a mistake to think that our technological advances: cars, big houses, industry, etc. allow us to live apart from the rest of the biosphere and the study of ecosystems, its structure and its operation, shows the depth of these relationships. In nature the atoms are arranged in molecules and in these cells . The cells form tissues and organs that these systems meet, as the digestive or circulatory. A living organism is made ​​up of several anatomical and physiological systems intimately linked together. The organization of nature at levels above the agency is of interest to ecology. The organisms live in populations that are structured communities . The ecosystem concept is even broader than the community as an ecosystem includes, in addition to the community, the environment is not live, with all the features of climate, temperature, chemicals, geological conditions, etc.. 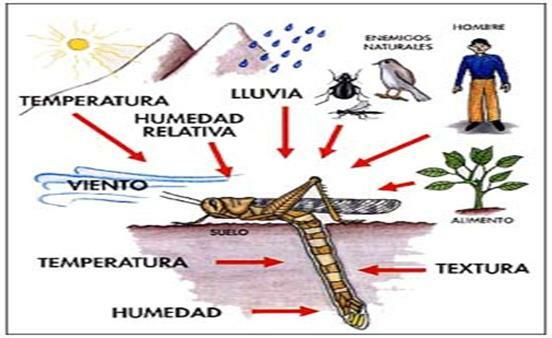 The ecosystem is the functional biological unit covering the bodies of a given area (biocenosis) and physical environment (biotope) accordingly. Then the ecosystem is the conjunction of the biocenosis (element biotic ecosystem) and thebiotope (element abiotic ). It is for this reason, the higher level of organization of living things. The term was proposed in 1935 by the English ecologist AG Tansley and is the basic functional unit in ecology and includes biotic communities and abiotic environment of a given region, each of which influences the properties of the other. An ecosystem is the biological functional unit of life, and is understood as a complex ecological system that encompasses the biocenosis , ie the set of living organisms or biotic elements of a given area (plants, animals, fungi, bacteria, insects, etc.) 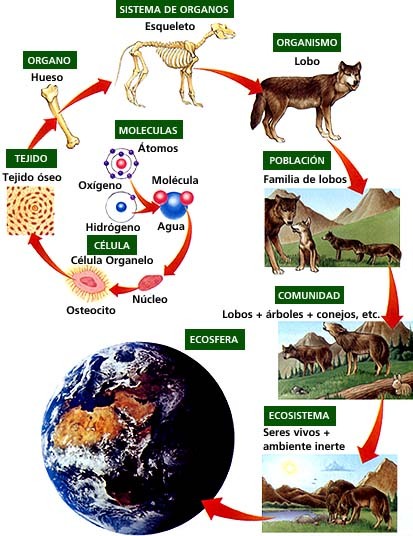 that interact through processes such as predation, parasitism, competition and symbiosis, while they are closely linked to the biotope , I mean the physical environment or abiotic element (the rocks, the earth, the rivers, climate) it to disintegrate and return to being part of the cycle of energy and nutrients, then consisting of biotic and abiotic material entities harmoniously integrated into a given space. Put another way, the ecosystem is considered a communitylocated in a physical , the habitat in which they are all related, living things (biota or biotic) and inert (abiota or abiotic elements) . The relationships between species and their environment, resulting in the flow of matter and energy in the ecosystem. The complex dynamics of an ecosystem involves a chain of interactions between all living and nonliving things within it, through which creates their coping mechanisms, and self-transformation. This determines the importance of preserving joint, so that no vital chain breaks, the end of which is that humans inhabit. The ecological niche refers to environmental conditions in which members of a species can survive and reproduce. 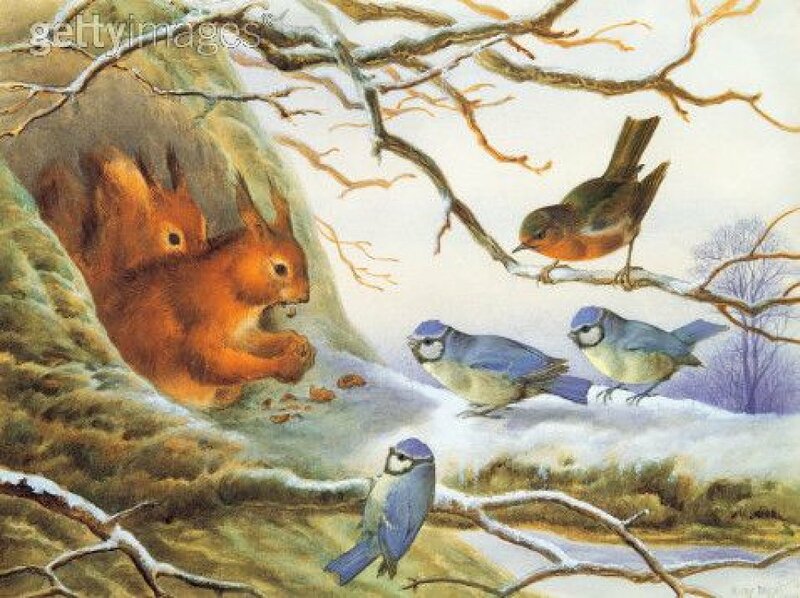 Two concepts closely with the ecosystem are habitat and ecological niche.The habitat is the physical location of an ecosystem that combines the natural conditions where a species lives and to which it is adapted. The ecological niche is how an organism is related to the biotic and abiotic factors in their environment. Includes the physical, chemical and biological species that needs to live and reproduce in an ecosystem. The temperature, humidity and light are some of the physical and chemical factors that determine the niche of a species. Among the biological determinants are the type of food, predators, competitors and diseases, ie species competing for the same conditions. What are the elements of Ecosystems? Abiotic factors are those elements of the ecosystem that have no life, but involved in an ecosystem, water, light, temperature are some. Inorganic substances: CO 2 , H 2O, nitrogen, phosphates, etc.. The organic components in the biotic phase synthesized proteins, carbohydrates, lipids. 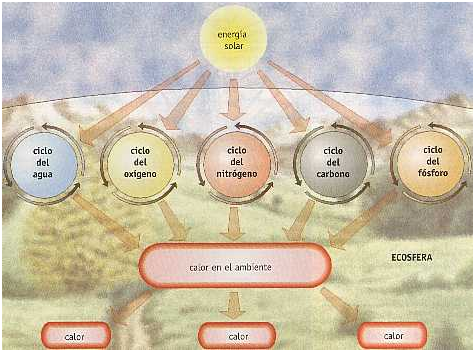 The climate, temperature and other physical factors. Abiotic factors are a complex set of interactions that limit control of the activities of organisms, populations and communities. The abiota is composed of energy, matter (nutrients and chemicals) and physical factors such as temperature, humidity, dew, light, wind and space available. The carbon, oxygen, hydrogen, nitrogen, phosphorus and sulfur are to the macro-nutrients , which are essential to living organisms build proteins, fats and carbohydrates or sugars. These six elements form organic complexes found in all living things.Alongside these are the micronutrients, which are required trace substances, such as copper, zinc, selenium and lithium, and are regulated by cycles along with the macro-nutrients to be available in the physical environment. The impact that a population may have on an ecosystem is something that ecologists have begun to understand. In certain ecosystems some species, called keystone species, play an important role in community structure. The biota is composed of living organisms in an ecosystem, which fall into two general categories: the autotrophic and heterotrophic .This distinction is based on nutritional needs and type of food. Different organisms in an ecosystem get the matter and energy of the environment in very different ways. Those that do one style are grouped in a set or trophic level. The functioning of all ecosystems is similar. All require a power source which, flowing through the various components of the ecosystem, life-maintaining mobilizes water, minerals and other physical components of the ecosystem. The first and main source of energy is the sun. In every ecosystem there is also a continuous movement of materials . Different chemical elements pass the soil, water or air to agencies and other living beings, until they return, closing the cycle, soil or water or air. 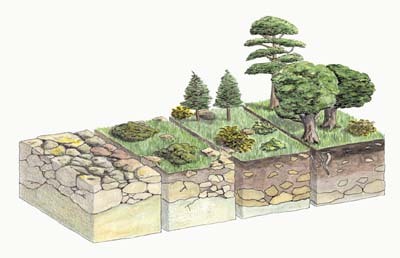 Ecological succession is the replacement of some other elements of the ecosystem over time. Thus, a given area is colonized by plant species increasingly complex. If the medium allows, the occurrence of mosses and lichens is succeeded by grasses, then shrubs and finally by trees. The steady state reached after evolution is complete is called climax. In it, the changes occur between members of the same species: for example, the new trees to replace the old. Ecological succession starts when a natural or anthropogenic causes (related to human intervention) clears a space of biological communities present in it or severely altered. Ecological succession is the natural integration of new dominant species, plant type to the medium; ecological regression, is the opposite, removing plants by different phenomena such as human action. The succession and evolution are different times . Replacement evolved species requires hundreds of thousands of years, while the succession is completed in hundreds of years. But both processes tend to favor the succession of species other specialized general, in general, tend to result in increased complexity. The evolutionary process takes place within the stream of self-organization of ecological systems, we call succession, and that helps explain their tendency to form increasingly complex and specialized. There are two types of succession: primary and secondary. Primary Succession : is one that takes place in an area devoid of preexisting community, ie, that begins in a biotope virgin, that has not been previously occupied by other communities, as in the dunes, new islands, etc. This type of process can last for thousands of years. 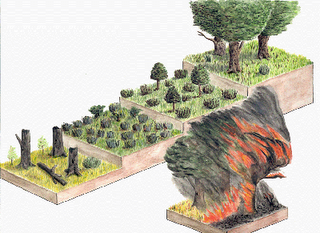 Secondary Succession : is one that is set on an existing one that has been killed by a disturbance such as fire, flood, disease, forest clearance, cultivation, etc.. In this case the environment and organic waste contains nutrients which facilitate the growth of plants. Succession is a process dominated by plants, in which animal communities change depending on the changes that plant communities.Change is unidirectional, sequential relative dominance of species in a community. It can be considered that the development strategy of the ecosystem is the increase in efficiency in the utilization of energy, such that each structural unit is maintained with minimum labor. In ecological terminology, the stages of development are called seral stages and the final stable state as climax. The Complete gradient of communities, which is characteristic of a given location, is called Sere . As expected, the rate of change is faster and the time required for completion of ones is much shorter secondary succession. The autotrophic succession is a type widespread in nature, which begins in a predominantly inorganic environment and is characterized by an early and initial dominance continues autotrophs. Heterotrophic succession : it is characterized by the dominance of autotrophs, which are presented in the special case of predominant organic environments. Those species that are important in the pioneering stages, you may not be important in the climax stage. When species density graph against time in a sere, you get a graphical ladder. Typically, the gradient in some species have wider tolerances or preferences niches other and, therefore, persist for longer periods. Both aquatic and terrestrial environments the total amount of organic matter and decaying organic material tends to increase over time. Also many soluble substances accumulate, these include azucarares, ammonia and many organic products of microbial decomposition. These liquid products are drained from the body of organisms often collectively known as extrametabólicos. The chemical regulation is a way to achieve stability in the community as we approach the climax, because the physical and chemical perturbations are damped by an extensive organizational structure are the two main factors leading to changes in species. Species diversity tends to increase with the succession. A decrease in net community production and a corresponding increase in the respiration of this are two of the most notable trends succession. The chemical elements which form living beings (oxygen , carbon, hydrogen , nitrogen , sulfur and phosphorus, etc.) ranging from about other trophic levels. The plants or the soil collected from the atmosphere and become organic molecules (carbohydrates, lipids, proteins and nucleic acids). The animals taken from plants or animals. After the van returning to land, air or water by respiration, feces or rotting corpses when they die. Thus ecosystem found throughout few cycles of oxygen, carbon, hydrogen, nitrogen, etc.. whose study is essential to understand its functioning. The ecosystem is operational thanks to the energy flow that goes from one level to the next. 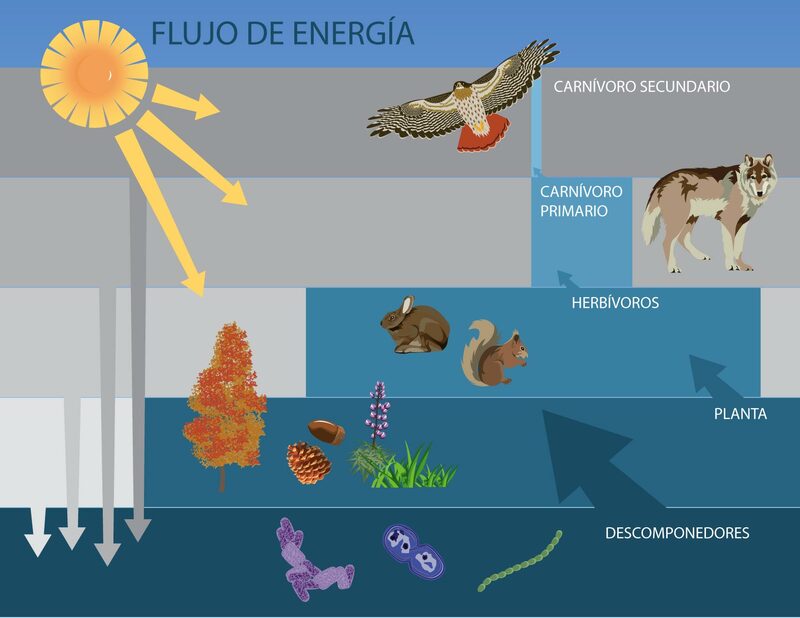 The energy flows through the food chain in only one direction: from the sun will always, through producers to decomposers.Energy enters the ecosystem in the form of light energy and comes out as heat energy that can not be reused to maintain other ecosystem functioning. It is therefore not possible power cycle similar to the chemical elements. The flow of energy is used by the primary producers or photosynthetic organisms (plants, etc.) 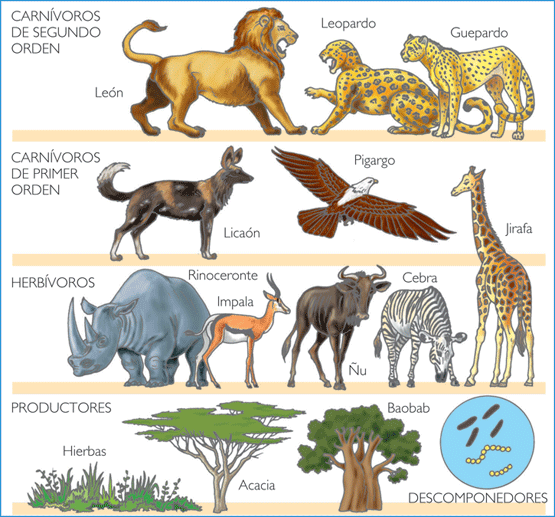 for the synthesis of organic compounds, in turn, used the primary consumers or herbivores , which would feed thesecondary consumers or carnivores . The bodies of all groups, thedecomposers can get the energy to achieve survival. Of this way will obtain a unidirectional power flow in which power from one level to another in one direction and provided with a lost as heat. Ecological pyramids depict the trophic structure of an ecosystem through overlapping horizontal rectangles we report transfers the energy of a community until the last trophic level. In the functioning of ecosystems not any waste occurs: all organisms, dead or alive, are potential source of food for other beings. An insect feeds on a leaf, a bird eats the insect and is both eaten by a raptor. When these organisms die consumed by decomposers that transformed into inorganic substances. These relationships between individuals in an ecosystem form the feed chain. The producers or autotrophs : able to synthesize complex organic materials from simple inorganic substances ie organisms capable of producing their own food. Auto , “himself”; trophos , “nutrition”. The phototrophs comprise the majority of the green plants and algae that use solar energy to convert relatively simple chemical elements, such as carbon dioxide, water and nutrients, complex compounds (carbohydrates, lipids and proteins). The chemotrophs convert inorganic compounds into energy, for example, the bacteria that live in the deep sea thermal vents around, which use the energy of hydroxide sulfate for nourishment. Through this process, substances destransforman minerals into organic compounds usable by all living forms. The heterotrophs or consumers are those who eat parts of cells, tissues or organic waste materials from other agencies for their livelihood. They obtain the necessary chemical energy directly or indirectly autotrophs, and thus, indirectly from the sun. 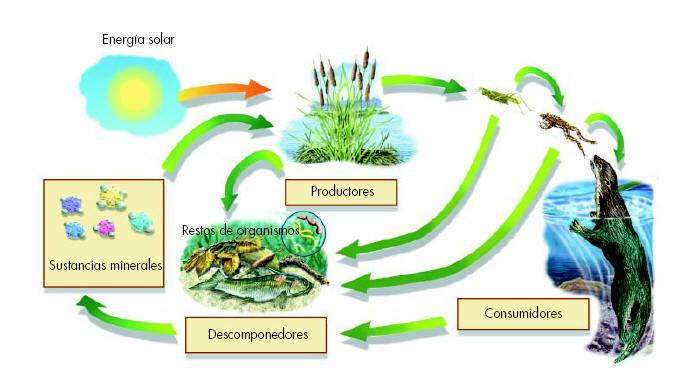 The macro-consumer or fagótrofos : heterotrophic, especially animals ingesting other organisms or organic fragments. Ingest parts and entire bodies, alive or dead, other, other organizations, this includes herbivores or primary consumers , the carnivores or secondary consumers , and omnivores or tertiary consumers . -The micro-consumers or sapótrofos : heterotrophs also called decomposers especially fungi and bacteria, which absorb decomposition products of dead organisms and release inorganic nutrients that can be reused producers. Includes detritivores or scavengers or (matter organic decaying, tissue parts and scrap). This organization of ecosystems is valid for terrestrial environments to the water. Both producers and consumers are. However, terrestrial ecosystems have greater biodiversity than water. Precisely because of this biological wealth, and its greater variability, terrestrial habitats offer more of different ecological niches and more. As a complex system that is, any variation in a system component will affect all other components. Why are so important relationships established. Ecosystems are studied by analyzing the feeding relationships , the cycles of matter and energy flows . Life needs a continuous supply of energy that reaches Earth from the Sun and passes from one agency to another through the chain food web . Supply Networks (meeting of all food chains) begin in plants ( producers) that capture light energy in photosynthetic activity and convert it into chemical energy stored in organic molecules. The plants are eaten by other organisms that form the trophic level of primary consumers (herbivores). algae <- krill <- whale. But not just food chains in the top predator (eg autillo), but as every living thing dies, there are ghouls, as some fungi or bacteria that feed on dead waste and debris in general (organisms decomposers or detritivores ) .This will solve the problem in the nature of the waste. Detritus (organic remains of living things) are often the beginning of new food chains. Eg., The deep seabed animals feed on debris that descend from the surface. Different food chains are not isolated in the ecosystem but form a network among themselves and often talks about food web. A useful representation for studying whole arrangement is trophic pyramids of biomass , energy or number of individuals. They lay several floors or its surface width proportional to the magnitude represented. On the ground floor are located the producers, consumers above first order (herbivores), then the second order (carnivores) and so on. Knowing the soil, grasslands, forests, oceans and wetlands, including several ecosystems, is fundamental to understanding how our planet.There are several types of ecosystems, widespread throughout the world, whose study allows an overall view of the progress that has been life on Earth. However, there is an even broader classification and effective, because their study includes an overview of all the major ecosystems of the world so that ecosystems that have similar characteristics are grouped in so-called biomes. The biomes ( bioclimatic zones ) are some appropriate divisions to organize the natural world because the organisms that live in them have common constellations of adaptations, particularly the climate of each of the areas and the characteristic types of vegetation that develop in them . A biome is a large ecosystem, a large tract of land that has a distinctive type of plant life. 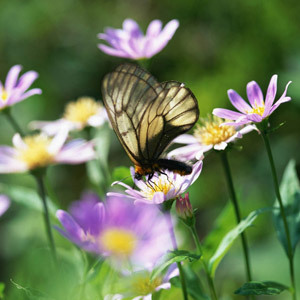 You can include many types of ecosystems, but the whole area is characterized by a particular type of plant life, as the prairie, the rainforest or any other characteristic biome. The location of the biomes on the Earth’s surface is mainly determined by the weather, especially rainfall and temperature. And the weather depends on many factors including the latitude (distance from Ecuador), ocean currents, topography, and prevailing winds. It should be understood that the climate is perhaps the most important element in determining the types of individuals who may live in an area and the ways in which they should be modified to live under different conditions of temperature and precipitation and seasonal distribution of these factors. Every place on Earth has its own climate, influenced by the region macroclimate as the microclimate of the particular location. But, on a large scale, there are some common factors that determine, for example, unrelated animals in the Sahara Desert and Sonora have surprisingly much in common. The soils are very important because they are essential to determine the types of plants (and therefore, plant communities) that will grow in a particular bioclimatic zone, in addition, also serve as substrates for the animals. And, in turn, the soils are heavily influenced by regional climate, as well as the geology of the bedrock. The soil, essential substrate of life on land. It will hold and feed it plant, whose production levels depend on other ecosystem; fundamental part of the soil are the large amounts of fungi, algae, bacteria and tiny animals that perform basic tasks in the ecosystem and are close cycles of elements or decompose the organic waste. The soil is, in itself, a complex ecosystem. The vegetation of an area depends on both climate and soil and, in turn, greatly influences determining which plant and animal species may exist in the locality. Vegetation varies in size and structure (physiognomy), in its manifestation seasonal, and how it changes over time. Its importance is greater than the sum of individual plant parts as many species of animals, for example, are influenced largely by the physical structure of the plant community while others are on the plant species itself. 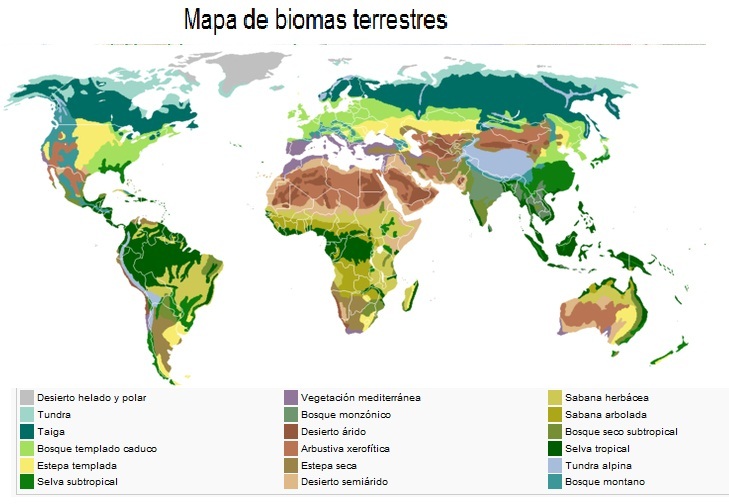 The different terrestrial biomes: tundra, taiga, forest, forests, steppes, meadows, etc.. Distribution at the surface of the Earth is determined by the weather and form a mosaic of lifestyles covering continents. Oceans and their various areas in which the depth, proximity to the coast, movements of ocean currents, etc.. determine different ecosystems with very different performances together. Needless to say, it’s hard to point out how biomes in the world, or what are the main ones, because there are several ways to classify: Some mention only five of them, and others extend to 15 or 20 different biomes. In coming issues, we will address in greater depth each, from their geographical location and climate, to its predominant wildlife. Since 1946, the FAO (United Nations Food and Agriculture Organization) has a monitoring role on global forest resources. Today, forests are under severe pressure due to increasing human demand for agricultural products and services, and this often causes degradation and conversion of forests into unsustainable forms of land use. When a forest is lost or degraded in a grave, their ability to function as a regulator of the environment also disappears, increasing flood and erosion, declining soil fertility and thereby contributing to the loss of plant life and animal. The consequences of this loss threaten the sustainable production of goods (timber, fodder, medicines …) and forest services (recreation, spiritual well …). The FAO made surveillance is performed with global programs such as the Forest Resources Assessment (FRA). This program is based on a different definition of land cover and covers several kinds of information: inventory data in each country, research and statistics on the processes of change in the covers and studies on the interaction between people and forests . Land covered by trees, with a canopy cover of more than 40% with a height greater than 5 meters. Includes natural forests and forest plantations. 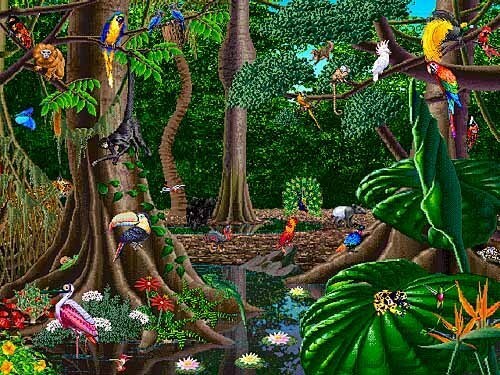 Rainforest tropical / subtropical. subtropical coniferous plantation / warm. Land covered by trees, with a canopy cover of between 10 and 40% and a height greater than 5 m (open forest) or mosaics of woodland and forest (forest fragments). 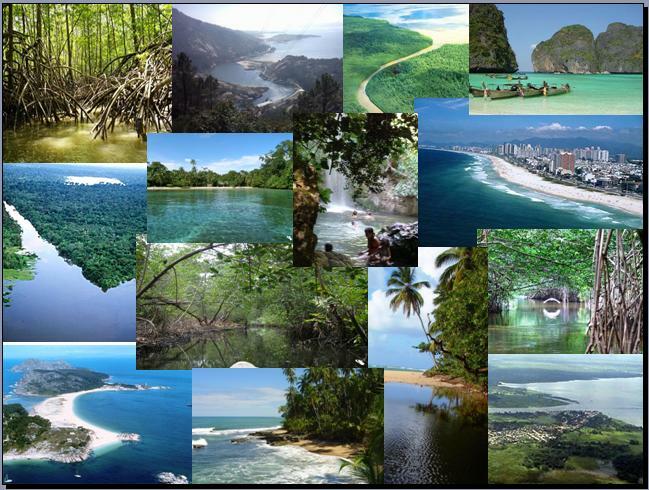 Includes natural forests and forest plantations. Nordic boreal forest / taiga open coniferous or mixed forest. Degraded forest / tropical fragmented. Earth with a tree cover, either 5 or 10% of trees taller than 5 m, or with a cover of shrubs or bushes of more than 10% and a height of less than 5 meters. Tropical woody savanna. All other land, including pastures, farmland, wasteland, urban areas. Grasslands, croplands, wetlands Nonwood desert city. 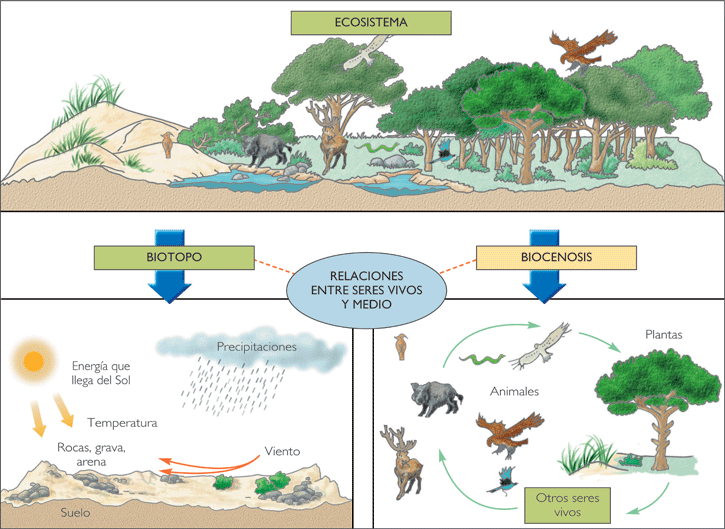 “Ecosystem.” Microsoft ® Encarta ® 2009 [DVD]. Microsoft Corporation, 2008.